Signs of yet more drought appeared again over the first portion of the 1865 crop season across Minnesota. Late-May and the first half of June were very dry, and the likelihood of a third successive droughty growing season began to loom, but frequent and heavy rains over the balance of June, through July, and over much of August brought its definitive end, the result being the most successful crop season in State history. Rivers and streams also rose to near normal levels for the first time in several years. Fall was exceptionally mild and fine, but start of a new unfavorable climatic trend that would predominate much of the coming two years, December brought early heavy snows and bitter arctic cold. Annual mean temperature in St. Paul was 43 F, total precipitation (38 inches) significantly greater than ’63 and ’64 combined. All quotes below, unless otherwise noted, are from the St. Paul Daily Pioneer. Heavy Precipitation Needed – Weather events were followed with much interest and anxiety over the early part of 1865 in Minnesota. Heavy snows were urgently needed to insure higher river stages by Spring. This, as described by Reverend Paterson, would mean cheaper steamboat freights, the release of millions of bushels of wheat suspended in storage in the Minnesota River Valley, and a replenishing of “largely empty” lumber yards by drives from the Upper Mississippi and St. Croix. Streams, lakes, wells, and springs also needed relief to satisfy the needs of people and livestock remote from the larger rivers. Such was the concern that a special convocation was held by the Minnesota Historical Society in mid-February, the subject: Should we be prepared for more drought in 1865?. Reverend S. R. Riggs, a missionary-farmer who had lived in the State since 1837 (and an official weather observer at Lac Qui Parle during the 1850’s), recounted that he “had never known a season so dry as the past two years”. Two or three droughts from some unidentified prior years were recalled, none of them, however, “lasting more than one season.” Consultation of Neill’s “History of Minnesota” text also identified two specific low water years: 1829 and 1839. While the gathering concluded that “droughts recur in every region”, including Minnesota, it appeared that the dry years of ’63-’64 were very anomalous, and there were “good grounds for supposing that we have seen the last of it”. January (mean temperature in St. Paul: 12 F) brought relatively uniform temperatures but undistinguished snowfall accumulations. Roughly half the afternoons reached the upper 20’s to mid-30’s with the highest reading 38 F on the 12th. Coldest spell was over the 24th-25th, each morning reading around -15 F. Heavier snowfalls began to be experienced in early February. The St. Cloud area reportedly had a twelve-inch fall, and two to three foot depths were soon known to exist in the upper waters’ region of the Mississippi and St. Croix as well. By mid-month, news also came of heavy snows at the headwaters of the Minnesota, depths in some districts reportedly three feet. A “fair” stage of water, at least, now appeared likely on the Mississippi and Minnesota. In St. Paul the month went down as one of “moderate temperature”, mean temperature (23 F) the highest here locally since 1845 of the Snelling era. Only two mornings were observed below zero, more than half of the afternoons in the 30’s, although just one surpassed 40 F. Total melted precipitation was 1.85 inches. March, barely warmer than February, featured some of the most blustery weather of the winter with more heavy snows. Monthly mean temperature in St. Paul was 25 F, some 21 inches’ snow recorded. A two-day storm opening the month dropped a foot on both St. Paul and St. Cloud, with 18 inches recorded at Crow Wing. In its wake, a bitter arctic blast swept through, the mercury sinking to -26 F on the morning of the 4th in St. Paul, other parts of the city reporting readings as cold as minus 33. This marked the first time locally since 1833 that the lowest temperature during a given winter had occurred in March. Following a second snowstorm on the 8th-9th, another arctic surge on the 10th brought –25 F temperatures as far south as Rochester. Thawing conditions set in after the 17th, with afternoon readings consistently in the 40’s and sometimes higher, 57 F reached on the 30th in St. Paul. About this time in the southeastern part of the State, various streams and rivers went on brief “sprees”, destroying property and washing away “numberless” bridges. March’s heavy precipitation falls were very encouraging, raising the hope, as Reverend Paterson wrote, “that the long and trying drought of two years has terminated, and that the seasons of this country are returning to near normal conditions”. Signs of More Drought in Spring – March’s closing optimism gradually disappeared during April, a “disappointing” month with frequent cold nights “and snow as late as the 21st”. Mean temperature in St. Paul was 43 F, just two afternoons as warm as 70 F all month, both of these during the last week. A violent all-day gale, the most severe “of which there was a remembrance”, occurred in the central and south on the 6th following heavy rains. Extensive damage to property was reported; in Red Wing, a towboat was blown from its fastings onto the still ice-locked Lake Pepin and sunk. Waves two to three feet high were also reported at Hastings. The strong circulation around the storm drew down unseasonably cold air in its wake, and on the morning of the 8th, Fort Ripley recorded -7 F at 7AM. E. H. Biggs on his self-registering minimum thermometer in St. Paul noted minus 2 F. A gradual warming trend followed, afternoon temperatures reaching the mid-60’s on the 16th and 18th (the first boat through Lake Pepin having reached the city on the 15th). But another wintry outbreak set upon the area on the morning of the 21st, with a “driving snow storm” covering the ground in most localities, and afternoon temperatures confined to the high 20’s. 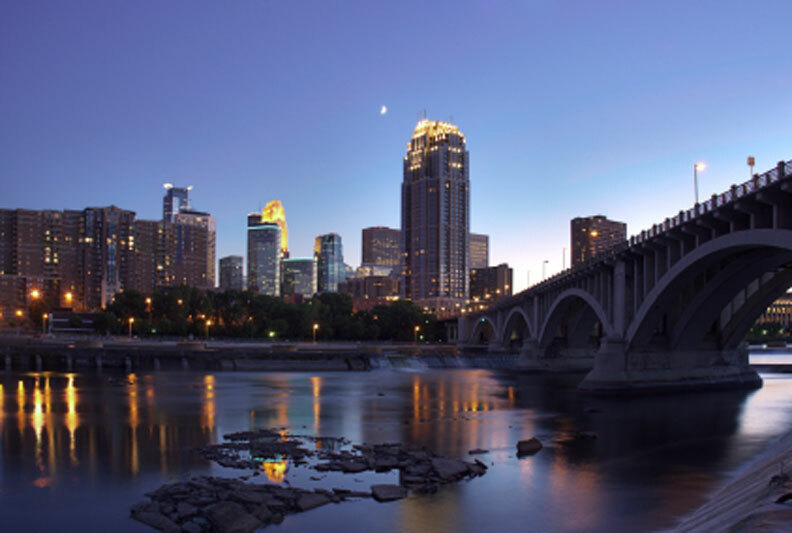 In spite of the month’s “abundant rains” (4.29 inches melted precipitation falling in St. Paul), the eagerly anticipated rises in the rivers were only modest and short-lasting. The Minnesota at Mankato had enough water in the channel for large boats on the 1st of April, but by midmonth it was falling rapidly, the outlook for the coming season pessimistic already for movement of wheat. Wrote one commentator: “The Minnesota for the past year or two has been but a poor apology for inland navigation. We want the Valley railroad built and the sooner the better”. This long awaited undertaking would finally be commencing later this year. May (mean temperature in St. Paul: 57 F; total precipitation: 4.20 inches) featured virtually no rain over the first two weeks. “As the month wore on [through the first two weeks] without rain”, wrote Reverend Paterson, “the public mind became very sensibly depressed, as the business prospects of the season, and indeed of future seasons, became clouded”. “Sharp” frosts occurred on the 10th and 11th, but like last year at this time, vegetation was too backward to be damaged. A brief but welcome respite came over the 15th-20th, abundant rains falling statewide, “refreshing bountifully the earth [and] raising the river and the tributaries”. But following this, a new extended dry period took hold, virtually no additional falls to be had again until the middle of June. To add to the misery, “a very oppressive” nine-day heat wave set in, beginning on the 28th. Afternoon temperatures through 5 June were consistently in the mid-80’s to low 90’s. The Drought Finally Broken – June (mean temperature in St. Paul: 67 F) gave early signs of the almost unthinkable — a third successive summer of drought. Just 1/5 inch of rain fell in St. Paul over the first 13 days, “fears… beginning to be entertained that the features which marked the two past summers were about to be repeated”. Up the Minnesota River Valley, this certainly seemed to be the case, grasshoppers, that symbol of drought, again infesting wheat fields and gardens. Initiated by “grateful” rains on the 14th, a dramatic and welcome change, however, was now in store. “Copious falls” followed additionally over the June’s remaining days, start of an extended wet/cool regime that would predominate the rest of the summer. Newspaper headlines like “More Rain – In Fact a Rainy Spell” soon began to appear in the St. Paul press, and remarks from the 29th’s edition reporting that “[we are having] a daily rain storm now”. Despite the slight falls over the first half, June finished as the second wettest calendar month (6.72 inches) in local St. Paul history up to this time. Afternoon temperatures, having been mostly in the 80’s over the much drier first half, retreated to the mid-60’s to low 70’s for the second. The effects on the crops were “miraculous”, and almost overnight a record harvest was suddenly anticipated across the State. Very cool temperatures and more heavy rains in July, particularly in the extreme south, went farther still to undo the drought’s cumulative effects. Monthly mean temperature in St. Paul (65 F) still ranks as the coolest such figure locally for a July in Twin Cities area history. Highest 2PM temperature all month was only 84 F, “nearly half” the 7AM readings in the 50’s, indicative of a number of overnight minima in the 40’s. The cool weather was not ideal for corn, but for urban dwellers in St. Paul, at least, it was one of the healthiest summer months yet chronicled. Mortality was much less than July ’64. A severe storm in Rochester on the night of the 3rd, unequalled in severity in this region “since its settlement by whites”, dropped “some 6 or 7 inches of solid water…”, nearby Viola experiencing a tornado which damaged post and board fence. Throughout Southern Minnesota at mid-month, “springs, rivulets, and rivers” were the highest seen at this season in “3 or 4 years”. While the Minnesota and Mississippi rivers reached only “fair” levels by this time, steamboatmen nevertheless were “all in ecstasies”, merchants and grain shippers in Mankato, in particular, “overjoyed” as the big boats could once again pass over the downstream rapids to reach the city. Streams, lakes, and marshes across the State, some of which had dried up, were “now pouring out again.” The rains also did wonders to revive those crops in the Sauk River Valley which had been severely damaged by frost in mid-June, along with those which had been ravaged by grasshoppers in Renville, Brown, Blue Earth, Nicollet, LeSeuer, and Scott counties. August brought even heavier rains, concerns beginning to be felt of too much. In St. Paul, Reverend Paterson totaled 9.16 inches, the wettest calendar month yet in his record-keeping experience. Another volunteer observer in the city reported 12 inches, other areas over the State’s settled part having similarly heavy amounts. Despite the frequent days of severe storms and wind, “a harvest never equaled in Minnesota” was “safely secured”, the Mississippi river brought up to “a fine stage” for the first time in three years. The success of this year’s crops despite the frequent wet and inclement weather, and the tolerable performances of ’63 and ’64 was compelling evidence, in Reverend Paterson’s view, that “our soil … can bear up alike under the scorching suns of drought, or the full charged clouds of rain… surely the experience of seasons so different should more than ever command our State to the attentions of immigrants”. Monthly mean temperature (66 F) in St. Paul completed one of the cooler summers here in recent years, no 2PM temperatures as high as 80 F until the last few days, 84 F noted for the 29th and 85 F for the 30th. Start of a Severe and Protracted Winter – December (mean temperature in St. Paul: 9 F) brought a sudden descent to winter during the second week. The first ten days were generally seasonable in temperature, a number of afternoons in the low 30’s, mornings generally in single figures. The 10th reached 36 F for month’s warmest, but the next day, “Old Boreas” suddenly swept in with “The Big Storm”, bringing gale-force winds and snows of more than a foot accumulation in some places. This introduced the “severe and changeable winter” of ’65-’66, long to be remembered for its “cold snaps, fearful storms, and a large number of successive cold days.” St. Paul reported 18 inches “on a level” from this first storm, Red Wing receiving 15 inches. All three of the embryonic railroads leading out of the Twin Cities area, the St. Paul & Pacific (completed to Elk River), the Minnesota Central (completed to Faribault), and the Minnesota Valley (completed to Shakopee) were blockaded for several days, an inauspicious start for their first winter of service. Temperatures also fell below -20 F over most of the settled areas in the storm’s wake. Another heavy storm struck on the 18th, followed by even more extreme cold, morning minima approaching -30 F in the more settled areas on the 21st. Coming as early in the season as they did, the heavy snows were most welcome, the resulting good sleighing, of course, facilitating trade, cheapening wood, and with some much time yet remaining in the season, enhancing the likelihood of high water in Spring. A “brilliant” exhibition of moondogs was seen on the night of the 21st across the State. Long-time (40 or 50-year) residents of Minnesota and the Lake Superior region had reportedly never witnessed such a spectacular display.